Why auto post on Social Media networks ? Social Media has become important platform for traffic generation and search engine optimization.It is good idea to post your new content on social media networks.Nowadays every website has Facebook page and Twitter account.Instead of growing email subscriber list Website owners are paying emphasis on increasing Facebook Page fans and Twitter followers. Email subscription was used to keep your visitors updated with new content published on your website.You should also notify your Facebook Page fans and Twitter followers with new content.This serves the same purpose as was served by Email to subscribers.But social media has added benefit of making your content viral. 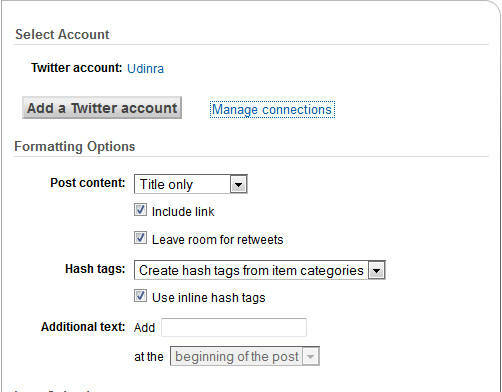 But manually publishing your content on social media networks is not possible if your blog has multiple authors or you are regularly adding new content in great number.It also becomes difficult if you have more than one website.So it is good to have process for automatically posting your new content on social media sites. The important social media networks are Facebook,Twitter and Linkedin.I will cover in this article method to auto post on these social media networks.The process takes few minutes to configure once.The entire work flow does not require installation of any software or any manual intervention. Note this is one time configuration.It would be great if you can performs steps mentioned in this tutorial in parallel.The first step is auto post on Twitter.I assume you already have Feedburner account.If you do not have then you can create it for free.You can sign up using your GMAIL id. After signing to Feedburner go to Publicize tab. Add your Twitter account attached with this website.This is very simple. You can also change different configuration options and use preview option to review the setting.This way you can customize it according to your need. So your Twitter followers will get notified about your new content.Now its time to update your Facebook page fans about new content. Scroll down the page.You can see option to connect your Facebook account. Do the necessary steps to connect your Facebook account. Configure it to post on your Facebook page using simple drop down. So above two steps have helped you automatically post your new articles to Twitter and Facebook.So you have both of social networking giant covered. Above process is applicable to all websites irrespective of platform they are using.They should only have a feed to burn into Feedburner.I will be discussing about WordPress in detail below.Above process is manual and is suggested for WordPress also.But there are some plugins which make whole task much easier. There are several plugins for auto posting your new content on social media.Some of them are totally free and some have both free and pro version. This is most downloaded plugin in this league.It supports all major social networking sites like Facebook,Twitter,Linkedin,StumbleUpon and many others.It is second plugin if you consider number of social networks supported.So you can install this plugin and automate the process mentioned above with ease.The configuration options are self explanatory. But the feature Facebook Image post is only available in pro version.So in case you want this feature the most you should try below plugin.But below plugin does not support social networks other than Facebook,Twitter and Linkedin. Social Media Auto publish is completely free plugin.This plugin auto posts on Facebook,Twitter and Linkedin.The plugin does require configuring these three social network applications.So some manual work is needed indeed.The configuration options are self explanatory. This is another totally free plugin.It supports Facebook,Twitter,Linkedin,Plurk,Diigo and few other social networking sites.You need to configure different social networking site applications.The configuration steps are mentioned on the plugin page. It does not overwhelm you with lot of configuration options also. This plugin supports lot of social networking sites.It also has additional feature of adding social media buttons to your website.So you can use single plugin for both auto posting the content and displaying social media buttons on your website. The huge number of social networking sites supported make this plugin a strong contender.It is third most downloaded plugin as of writing in this league. So if you want all these features then you can go with this plugin.Most of the blogs use Facebook and Twitter as major traffic generator.So it is a good choice considering the range of functionality provided.But I would like to see support for Google Plus and LInkedin as well.But it is top plugin if you consider number of functionality provided by it.It is also second most downloaded plugin in this league. I personally prefer sharing my post on social networking sites manually.This does give me luxury of selecting optimal time to share the post.It also help me write customized text along with post link.I will suggest you if possible practice the manual way but if not feasible you can use above steps. Are you using manual posting or auto posting? Thanks for the useful info Esha. Plugins are indeed a lifesaver for WordPress users like us. We usually want this social sharing stuff automated but as you said manual sharing gives us more control over this crucial aspect of blog promotion. I use Shareaholic plugin at my blog DiGi-PASSION to bookmark my posts but do it manually as per my timings.